We hope you will consider contributing to the National Forum. Donate online or mail your contribution check payable to the “National Forum for Heart Disease & Stroke Prevention” to 1150 Connecticut Ave., NW, Washington, DC 20036. You will receive a receipt for your tax records. 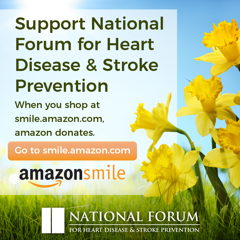 Or, consider selecting the National Forum when shopping on Amazon.